TORONTO, Ont. — Canadian spot market freight volumes spiked in September, delivering an optimistic increase at the end of the third quarter after two consecutive months of unflattering load volumes. TransCore Link Logistics’ Canadian Freight Index saw load volumes increase 7% compared to August, but was still down 25% year-over-year. Third quarter load volumes dropped 22% compared to Q2 and 28% compared to the third quarter of 2014. 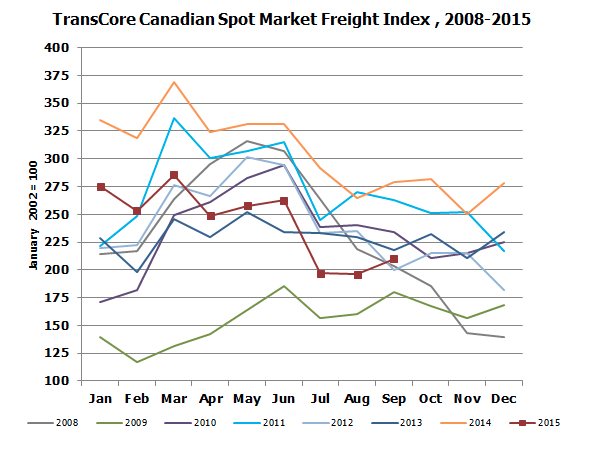 Intra-Canada load volumes represented 28% of total volumes, slipping 19% year-over-year. Cross-border loads leaving Canada decreased 8%, and loads coming into Canada fell 40% year-over-year, TransCore reported. Equipment capacity increased in September by 2% month-over-month and 29% year-over-year. The equipment-to-load ratio declined to 3.29 from 3.47 in August. Year-over-year, the ratio was up 72% from 1.92 in September 2014, TransCore reports.